I felt it was appropriate to launch this blog with a few words on the current situation of US internationals. First of all, I'd like to see more coverage on TV of all of our American players abroad. Soccer365 has a nice section but it's not updated enough and it's only available online. I wish FSC would show more coverage of our players in foreign leagues with stats and interviews. I feel that US internationals have advanced significantly in the past two decades and that they have only fallen short due to lack of concentration and lack of a proper schedule of international games. I feel that Bradley has done a superb job with the friendlies he has played in 2007. The last couple of wins outside of US soil are especially important for future aspirations. I concur with the idea of playing Mexico at Mexico for a friendly and not just for WCQ. It's true that Mexican fans will always show up in large numbers when playing in the United States but facing the full grandeur of a sold-out Azteca stadium is equal only to standing at the grandest stage of a World Cup game. Playing against the 12th man and a hostile environment and winning is the greatest prize a US team could get. This brings me to my next point: Mexican players are increasingly spreading their seeds throughout the considerably more competitive fields of Europe. Players such as Vela, Dos Santos, Castillo, and Salcido are just a few of the names that should resonate in the halls of USsoccer because these are players that exhibit their skills with some of the greatest teams of Europe. I feel it's ridiculous that Dos Santos is playing for Barcelona and Vela is waiting for his shot with Arsenal while US players are relegated to middle of the road teams such as Fulham, Reading, and Racing Santander to name a few. I applaud Beasly's role with Rangers. I equate that team's level to Salcido's PSV. 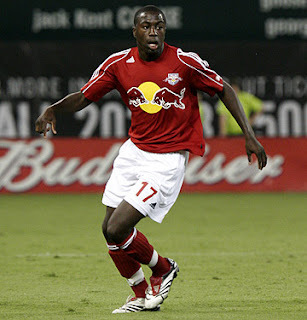 Adu is in a great team now (Benfica) but he's still not a dominant player. So why not let Altidore go to Real? Why not have an American player in one of the world's wealthiest (both financially and historically) teams? I'd like to see a Real Madrid - Barcelona Superclasico where mexican players pay american players in the world's largest stage. I also say that we let go of Maurice Edu, Taylor Twellman and Landon Donovan (for God's sake, the man is a machine and he's still not getting proper recognition!). I hope Altidore does go. He's young and unafraid of the world stage. I think he could be the kind of player that might have a breakout season and earn his place in the team and recogn ition for his country and an increasingly competitive MLS. Good luck, Jozy!